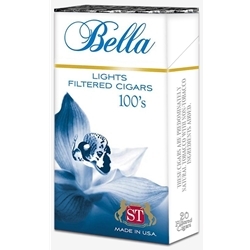 Bella Light Filtered Cigars are available in Box 100's and packaged 20 cigars per pack, 10 packs to a carton for a total of 200 premium filtered cigars. Specifically designed with the female smoker in mind, Bella Filtered Cigars are elegantly packaged with the comfort and luxury style that gives a feminine alternative to the stronger masculine brands out on the market. Introduced in 2011, Bella’s are produced in 100’s Box only, with a longer filter in a more rigid, clean-cut pack. Prepared with high quality American tobacco manufactured directly in the United States. Smokers Discounts offers the Bella Filtered Cigars as a high quality product at a low discount price.